THURSDAY, Feb. 2, 2017 (HealthDay News) -- Women whose breasts are predominantly made up of more dense, glandular tissue face higher odds for breast cancer, a new study finds. The researchers added that, based on their study of 200,000 women, breast density may be the most important gauge of breast cancer risk, eclipsing family history of the disease and other risk factors. "The most significant finding in this study is the impact of breast density on development of breast cancer in the population," said study senior author Dr. Karla Kerlikowske. She is a researcher in the department of epidemiology and biostatistics at the University of California, San Francisco (UCSF). Still, not everyone is convinced that breast tissue density is the preeminent risk factor for breast cancer. Dr. Kristin Byrne is chief of breast imaging at Lenox Hill Hospital in New York City. She believes that the numbers in the study attributed to risk based on tissue density seem "incredibly high, especially when other risk factors were not taken into consideration." Byrne said, "Before these patients are placed on drugs such as tamoxifen, which have significant side effects and are intolerable for many people, more studies are necessary." As the UCSF researchers explained, glandular tissue appears dense on a standard mammogram, while fatty tissue is less so. And many factors can influence the composition of breast tissue. Overweight or obese women typically "have lower breast density, though age is a strong determinant of breast density as well," study first author Natalie Engmann, a Ph.D. candidate in UCSF's department of epidemiology and biostatistics, said in a university news release. "Dense breasts are more common in younger women, and most women experience a sharp decline [in breast density] during menopause that continues in the postmenopausal period," she added. "However, postmenopausal estrogen and progestin [hormone] therapy can reverse the decline of breast density with age." Denser breasts have been thought to be more prone to tumors because of cellular factors, and also because smaller tumors in dense tissue are tougher to pick up on mammograms. The new study sought to quantify the risk. To do so, Kerlikowske's team tracked outcomes for about 200,000 U.S. women in the national Breast Cancer Surveillance Consortium, a database aimed at assessing breast cancer screening. About 18,000 of the women had varying stages of breast cancer, while the remaining 184,000 did not. The study participants had their breast densities recorded and were split into four categories: category A, breasts made up almost entirely of fat; category B, breasts scattered with dense tissue but mostly fat; category C, those with moderately dense tissue; and category D, breasts where dense tissue makes up at least 75 percent of the breast. The research team then looked over a range of known breast cancer risk factors -- a family history of disease, a woman's prior history of benign breast lesions, her breast density and having a first baby after the age of 30 -- to determine the effect of each on cancer risk. 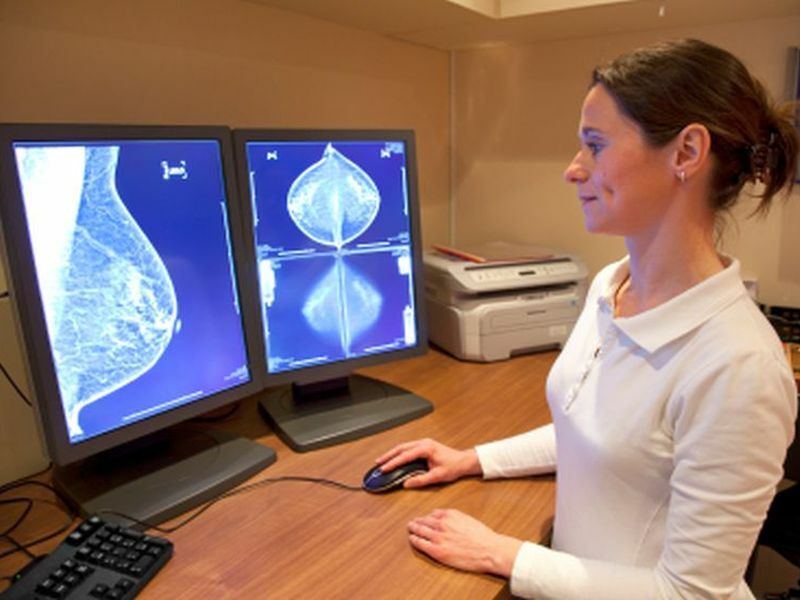 Overall, breast density was the most prevalent risk factor for breast cancer, the UCSF team reported. Based on its calculations, Kerlikowske's team estimated that about 39 percent of breast cancers in younger, premenopausal women could have been prevented if those in the two higher tissue density categories had been shifted to a lower density category. About a 26 percent reduction in breast cancers for older, postmenopausal women was also estimated, using the same calculations. Unfortunately, there's not much a woman can do about the density of her breast tissue, the researchers noted. "Treatment with tamoxifen, an estrogen hormone blocker, is the only intervention currently known that substantially reduces breast density, and thus reduces breast cancer risk," Engmann explained. "However, tamoxifen can have serious side effects and is generally only recommended for women at high risk of breast cancer, with guidance from their physician. Our study highlights the need for new interventions to reduce breast density for women at average risk," she added. Simply gaining excess weight -- even though it tends to add fatty tissue to breasts -- would not lower a woman's risk for breast cancer. That's because the UCSF study, along with prior research, found that obesity also raises breast cancer risk in older, postmenopausal women. Other factors added less to overall breast cancer risk than many have previously supposed, the study found. For example, prior family history of the disease accounted for less than 10 percent of cases. Finally, waiting to have a first child until after the age of 30 was linked with a nearly 9 percent added risk of breast cancer in premenopausal women and a 5 percent increased risk for postmenopausal women, the study team said. The study was funded by the U.S. National Cancer Institute and is published in the Feb. 2 issue of the journal JAMA Oncology. For her part, Byrne said women with dense breasts shouldn't panic at these results. "It is not clear if reducing breast density will decrease breast cancer risk," she said. "Older age and gaining weight after menopause are both related to lower breast density -- but are also related to an increase in breast cancer risk," Byrne said. The reasons behind the development of any one breast cancer remain complex, she added. "There are other contributing risk factors such as alcohol use, sedentary lifestyle, use of birth control, postmenopausal hormonal therapy, menstrual history, radiation exposure, as well as family history of breast cancer," she said. "I think that assessing all of these risk factors is necessary to decide what a person's actual risk is." Dr. Cynara Coomer is chief of breast surgery at Staten Island University Hospital in New York City. She agreed with Byrne that any attempt to alter breast density comes with its own hazards. While gaining excess weight can lower tissue density, "obesity has been implicated in many diseases, including breast cancer, in postmenopausal women," Coomer said. On the other hand, "tamoxifen is the only medication that can decrease breast density," she said, but, "like much of medicine, the risks must be weighed against the benefits." Some of those risks include a higher chance of developing uterine cancer or deep vein thrombosis, which are blood clots in the legs, Coomer said.